The coil gap, or air gap, is the specific distance between the flywheel's magnet and the ignition module. When the flywheel spins and the magnet aligns with the ignition module, a high voltage spark is sent from the ignition module to the spark plug. This precise distance needs to be maintained, otherwise the magnet will not align with the ignition module and no spark will get fired. If you are having spark issues during starting or operation, an incorrect air gap is often the cause. 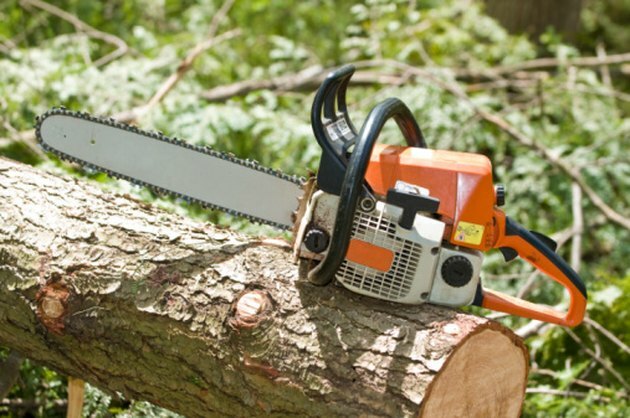 The coil gap controls the discharge of the electric spark on your chainsaw. Undo the four bolts holding the fan cover over the flywheel and ignition module. Pop the fan cover free with the tip of a screwdriver. Disconnect the short circuit wire, which runs from the ignition module to the "STOP" switch, from the tag connector on the side of the ignition module with the screwdriver. Undo the two mounting screws holding the ignition module to the engine. Lift the ignition module up and away. Remove the short circuit wire and ignition lead wire, which run to the spark plug, only if they are faulty and need to be replaced. Set the ignition module back into place. Tighten down the bolts halfway. Turn the flywheel until the magnet on the flywheel aligns with the two arms on the ignition module. Slide the metal setting gauge in between the two arms of the module and the flywheel magnets. Press the ignition module over to the flywheel and tighten down the two retaining screws, tightening the top screw first, to the chainsaw's specified torques. Remove the setting gauge and insert the feeler gauge to ensure the air gap is the proper distance. Reinstall all other parts in reverse sequence.